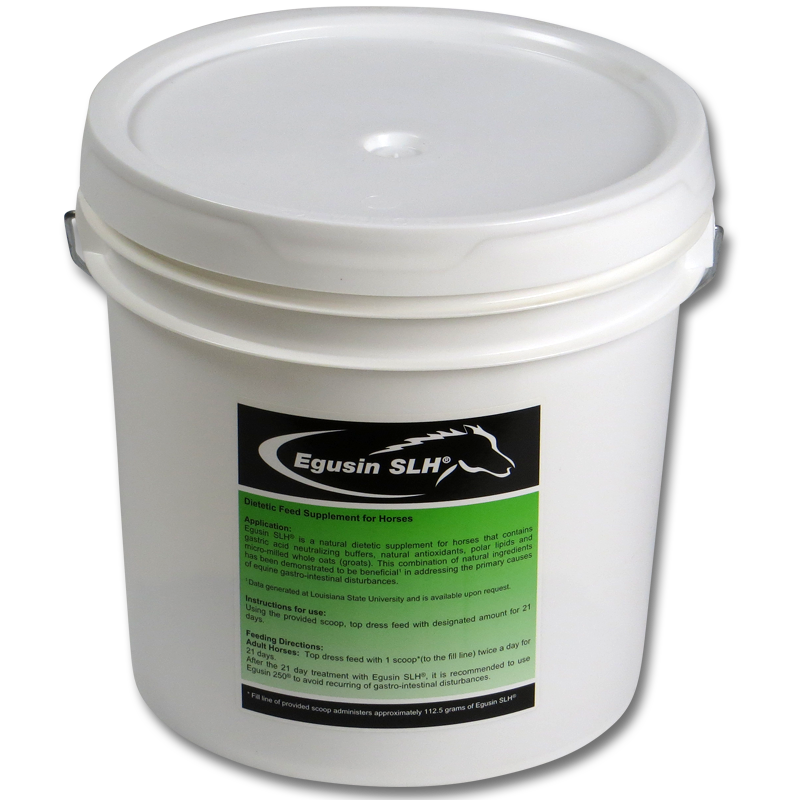 Egusin 250® is an alfalfa pellet based formulation of natural ingredients that has been demonstrated to be beneficial in promoting a healthy stomach and intestinal environment to avoid recurring gastro-intestinal disturbances in horses. Easy to feed. Seems to be keeping Prince ulcer free. Very palatable, my horse always ate all of the Egusin in her AM and PM grain. Very palatable, horse always ate it easily. My horse’s belly is no longer big (saggy). His sheath is not swollen. His temperament has improved. He is comfortable going downhill under saddle. Egusin was recommended by the vet. before use, horse was prone to mild colic. 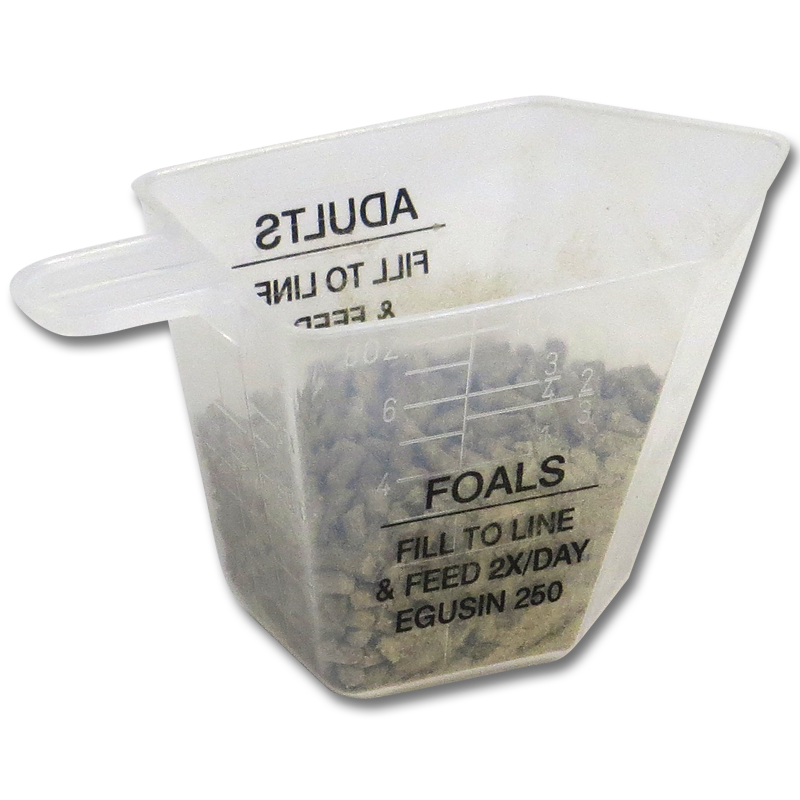 Since use – no episodes of colic. Rechecked by the vet (holistic vet) and he felt the problem was resolved. Very palatable – was worried about the product’s consistency, but Prince loved it. Have not used her for barrel racing since starting product. Her disposition has changed to good since using product. I’m planning a trip cross country in July-August. I have elected to give Lordy Egusin as a preventative for stress on trailering 1800 miles in addition to being in a busy apprentice program for 4 weeks at the Parelli Ranch in Colorado. Thank you for an awesome product! I treated horse in Jan. 2012 for ulcers. Horse tested positive on ulcer acupuncture points. Dull coat & nervous behavior, sensitive, highly reactive, picky eater. Within 2 weeks improvement could be seen. I have recommended this product to 5 people, all of whom have had great results. Also being a licensed Parelli Professional, I love “natural” products that work! 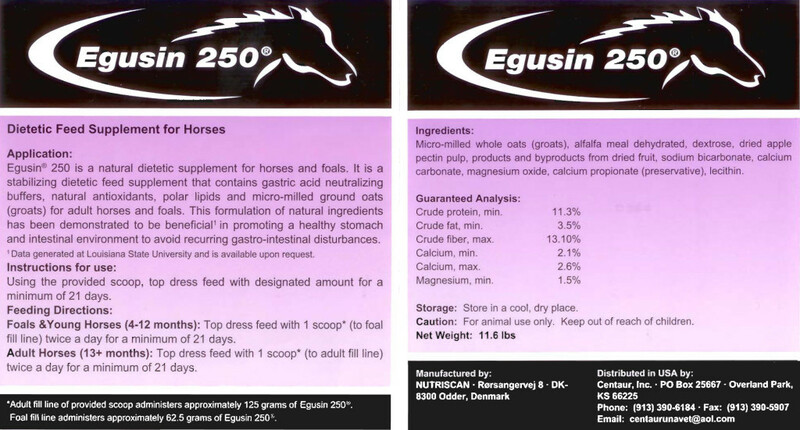 I have been using Egusin 250 for my Arabian mare with chronic laminitis for almost a year. She is on Bute daily and preventing ulcers is a major concern. 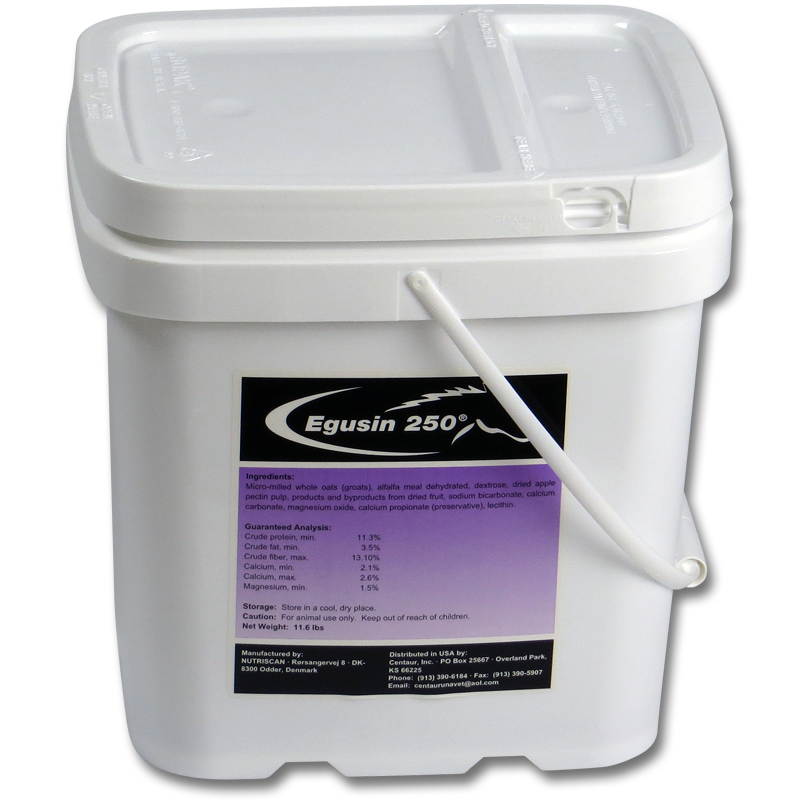 I was previously using Ulcer Guard and Gastro Gard until I heard about Egusin 250. 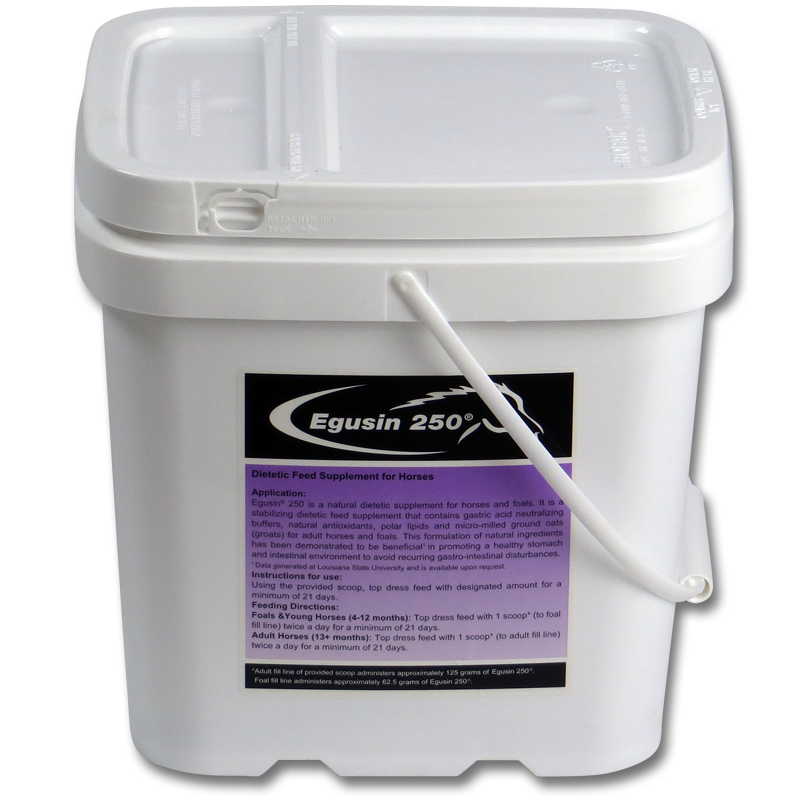 Egusin 250 is a great cost savings and has proven to be equally effective. I am very happy to have found your product. Jasper was scoped a year ago and had small ulcers. After treatment with Gastro Guard, he was better (it’s very expensive). He would then act like his stomach was bothering him and someone recommended Egusin. he seems much happier since being on your product…plus the price is good! •	My 13 yr. old TB gelding just finished his second week on Egusin SLH, and the product is already living up to and exceeding expectations. My horse had been subjected to many acute and chronic stressors that are known to cause ulcers (i.e. 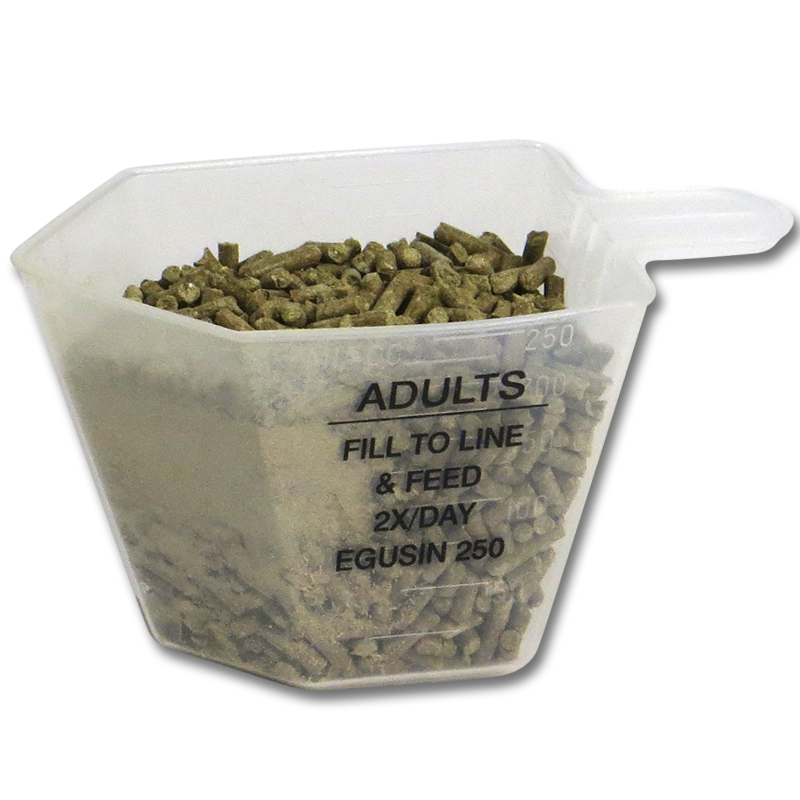 extended periods of stall confinement/lack of adequate for several years, a recent move to a new farm, and then a 6-8 week bout of rapid weight loss from an insufficient feeding regimen). In addition to these stressors, he displayed many signs of ulcers – watery stools, rapid weight loss, ferociously devouring food, dullness/lethargy, and extreme spookiness. After just two weeks on Egusin SLH, my horse has experienced remarkable improvements: his stools are normal/not watery for the first time in the 5+ years I’ve owned him, his weight has stabilized and during the second week he even started putting on some much needed weight, he no longer “inhales” food as if he’ll never eat again, he is perky and alert and I once again have to keep up with his walk instead of pulling him to keep up with me, he has a happy/peaceful twinkle in his eye instead of looking troubled/wary, and he is much less spooky/jumpy. Needless to say, it’s a huge relief to see him so happy and well, and Egusin will certainly be a staple in his diet going forward. I would say this product has made a difference in her eating and attitude. Not as girthy, has gained weight with no change in diet. Has more stamina at age 25. Came in dull, lifeless, no forward completely stuck, dry coat, and thin. 42 days later coat is amazing. Everything is completely different no longer suited for beginner lesson program. After nearly two years of struggling to clear Donny of ulcers using the most expensive ulcer treatments, I tried Egusin, keeping track of results with regular scoping. Not only did Egusin clear the last vestiges of ulcers, but also the residual inflammation that the vet and I had accepted as a chronic condition. He’s been happily ulcer-free and symptom-free for almost two years with Egusin. Came to me with major attitude. Ears pinned, kicking out, biting, poor weight, and dry coat. 42 days later, fat, shiny, sweet, still some ears back at the time, but dramatic improvement. Horse seems more responsive and not so dull.